It’s been a whole new year this week, so what have I been working on? Well I’ve been incubating the ick, hacking up a lung and producing my bodyweight in snot. Wasn’t that a lovely picture? ;o) In between that, I’ve been writing up patterns properly, 2 of which are now complete, and another of which I hope to complete by the end of the week. I’ve also been playing with some quilt blocks. That’s been seriously slow going as there’s been head scratching and maths, and, well, snot. I hope your first week of the new year has been better! The as yet unnamed Cherie quilt, using the Cherie line from Frances Newcombe. Gah! Sorry you've been so sick! Sounds awful. How awesome that you are working on something for Quilt Now this week. Eugh! Hope you recover very soon from your snotfest. I love the Cherie blocks you have made. Are you just choosing random blocks yourself or are you following a sampler pattern/design? 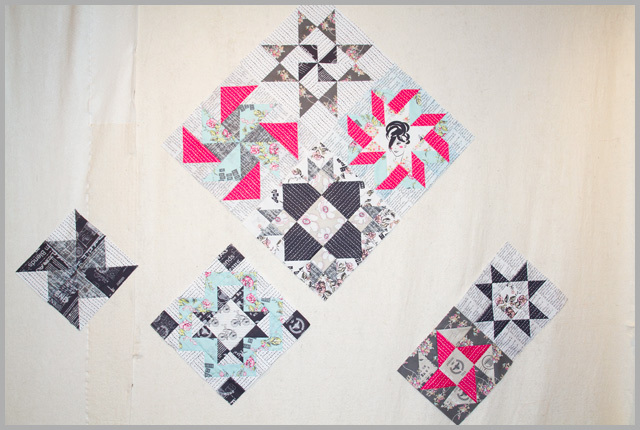 The blocks you've made for the Cherie quilt so far are lovely. I'm sure you'll come up with a great name for it. This is really neat, love the color palette. Lovely blocks! My week was not very creative so far as work is busy. Love your blocks! The fabrics you've chosen are so pretty. Very pretty blocks! I haven't noticed that fabric line around. Sometimes it takes someone to use it becais you notice it. Hope you feel better soon. Love your stars, they are beautiful. thanks for the snot graphics, off to vomit. love what you're doing with cherie tho! Well we now know you have a hacking cough and grotty snot….. I think may be you need to wash that quilt top? Cherie is looking lovely, a great selection of blocks. Hope you feel better soon. You've made a good start on that quilt. I'm a sucker for a pretty star block.